Yeah, yeah, yam sharks might be a little scary, but nothing is more terrifying than the Great Orange Tuber, the classic story of all times. This was a quick PhotoShop cut and layer job, based on a movie poster borrowed from MovieGoods, and using Joan’s tweeted yam photo. I stared at the photo a bit looking for a shape, and it cried WHALE. I did some cheap substitutes for the fonts on words changed from the poster. My usual approach is to magic brush in background stuff, and then do typography over the top. “Tuber at the top is Arial Black, which is close but not exact. The “YAm” on the bottom was Gil Sans Ultra Bold, again, close enough but not exact. I rendered the type to be bitmapped so O could magic brush in the wave textture over the letters. 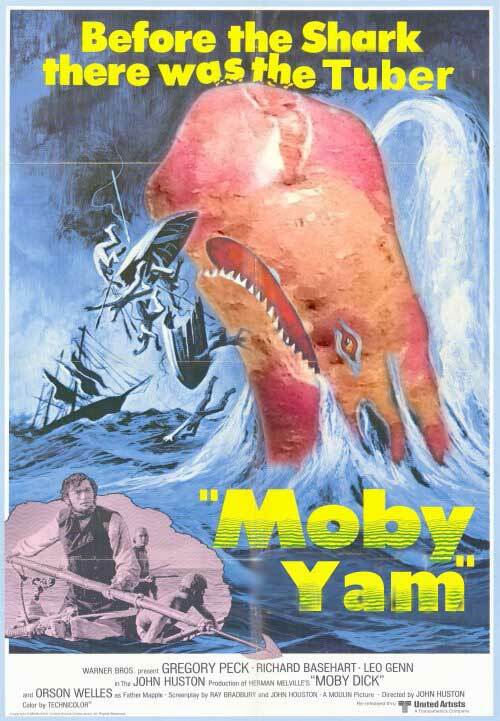 Add a yam to your favorite movie and make a picture.